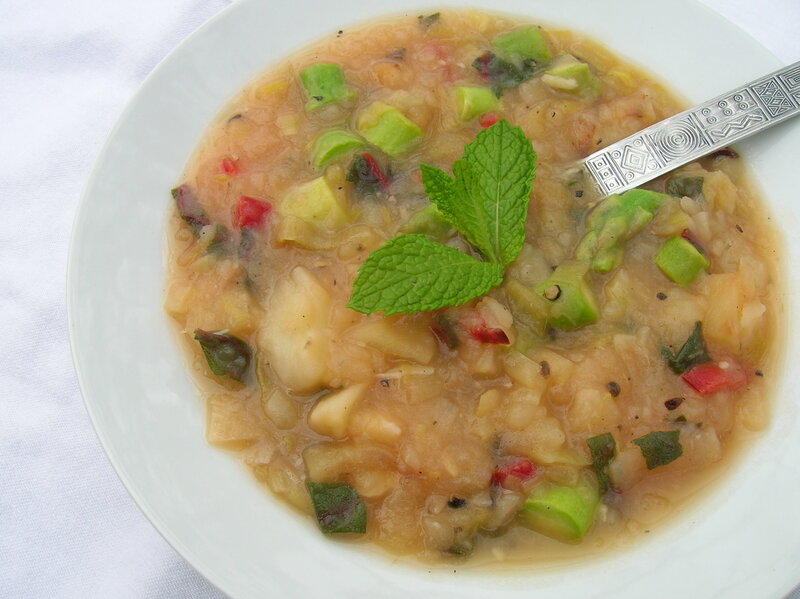 This is not your average potato leek soup. It has no dairy, waxes pink from a flurry of swiss chard stem antioxidants, flushes with a little sweet honey mead, and swoons mellow from roasted potatoes and leeks. That’s right, they are roasted before they are made into soup, and the sheet pan used to roast them get’s a stove-top deglazing with the white wine. Have you ever deglazed a cookie sheet before? I had never, and the technique made me think I was in a European kitchen wearing chef’s whites and a touque! The whole idea to roast the potatoes and leeks comes from Ina Garten, Back to the Basics. Using this technique definitely adds more time to the meal, but the flavor is quite stunning, and it was fun to use a few seasonal veggies as well as a bottle of mead from White Winter Winery in Wisconsin – getting back into the local scene after a long winter! Directions: Preheat oven to 425 degree. Toss the sliced leeks and potatoes with olive oil, salt and pepper and roast for about 45 minutes or until tender. Place the foil-wrapped garlic on the cookie sheet to roast while the leeks and potatoes cook. You may want to flip the veggies during cooking, but I don’t think it’s necessary. When the potatoes are tender, remove the cookie sheet from the oven and place on stove-top over medium heat. Here’s where you get to deglaze a cookie sheet! Pour in 1 cup of wine and scrape the crispy bits off the bottom. Mash the potatoes with a fork and mix with the wine. Remove the cloves of garlic from the head, and squeeze out the roasted garlic paste. Mix everything together. Let some of the wine cook off then scoop the mixture into a stock pot. Add about six cups of water or stock, salt and pepper to taste and more wine if you like. Bring it to a simmer. Add the swiss chard stems and allow to simmer for about ten minutes. Last, add the asparagus and cook for another five minutes on very low heat. You don’t want the asparagus to get stringy. It should be bright green and still just a bit crisp. Move over boring white whipped potatoes – here comes the new standard! Bring this beauty to Thanksgiving or any holiday party and you will never be short on invitations! This concoction sports potatoes of the rainbow variety that I found at the co-op today. Included are Cranberry Reds, Blue Potatoes, New Reds and a Garnet Yam. I boiled them, let them cool, slipped the skins of, smashed them with a fork and infused the dish with Indian spices toasted in peanut oil with a simmer of tomato. Very simple and over-the-top yummy! 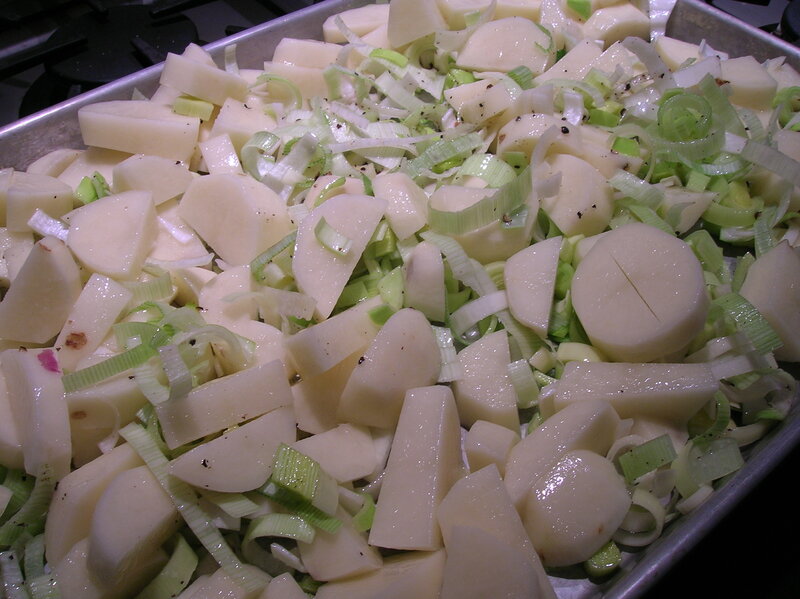 After the potatoes are boiled and skins removed, smash them with a ricer or fork. I like my potatoes a little chunky. Heat the oil in a pan and add all the spices. When the mustard seeds start to pop, add the tomatoes and cook for a minute or two. Mix the oil gently into the potato mixture and pour into a baking dish. Note: I kept the sweet potato out of the other potato mixture. I added a little salt to the sweet potato and put it in a well in the middle of the colored potatoes. Bake at 400 degrees for 45 minutes or until warm and beginning to brown on top. This is the sweet birthday cake my two favorite boys brought home from Whole Foods (cough, cough, shh, don’t tell, please!) It is an amazing lemon layer cake sandwiching lemon custard all wrapped up with a pretty buttercream icing. It is so delicious in all it’s sugary badness! This is the savory, healthy, adult version of the “birthday cake.” Thin slices of potato and roasted beets act as the crusts holding in the garlic speckled brown rice in place. To decorate, radishes were halved before roasting. This crazy concoction was tasty enough, but the beets didn’t really pair well with the rice and potatoes. The fact that they bled onto the rice gave the dish a unique esthetic, but the sweetness of the beets didn’t match the other flavors. The dish won points for interest and beauty, it’s definitely edible, but overall fantastic, it is not. How can we make thinly sliced beets into something fantastic? I had visions of a beet upside down cake of sorts. If you come up with anything, let me know! In the mean time, I’ll eat two birthday cakes for dinner! This potato salad is hearty, yet feels light and fresh with a lime and fresh basil vinaigrette. Foxtail Farm CSA vegetables included: red potatoes, green beans, cauliflower, garlic, basil, and red onions. Clean and prep the vegetables. The potatoes will be roasted on a separate cookie sheet from the cauliflower and green beans as they take a bit longer. Mix the diced potatoes with a little oil to coat and salt and pepper. Then turn them out onto a baking sheet and roast at 450 degrees until they are browned on the top. Do the same with the cauliflower and green beans – toss them in a bit of oil, salt and pepper and then spread onto a baking sheet. The potatoes will take about 45 minutes to roast and the green beans and cauliflower will take about 20 to 30 minutes. I didn’t keep track of my time, so just keep an eye on them. Once the veggies are roasted, take them out of the oven and let them cool. Meanwhile, mix the vinaigrette using a food processor. Pulse the garlic, basil, lime juice, Dijon, salt, pepper and oil. When the vegetables have cooled, mix the vinaigrette and onions into them and serve. Cooking sure takes on a new meaning when it’s performed after a full day’s work. Now instead of leisurely peeling carrots and marveling at their bright orange beauty, I find myself counting how many strokes of the peeler it takes to clean them of their lovely little roots. Did you know that Foxtail Farm’s carrots each take, on average, seventeen peels. The creamy fresh yellow potatoes take on average twenty-four peels and the same number of knife strokes to dice them! I’ve either developed obsessive compulsive traits, or I have math on my brain. As many of you know I have spent the last two months exploring the virtues of my CSA box while on summer break from my teaching job. You have benefited from my crazy cooking adventures. Now my energetic and very eager fifth graders are anxiously awaiting the first day of school, and I am busy setting up a wonderful learning environment so their learning can be maximized. I’ve turned my attention away from menu planning and back to lessons. The blog is definitely enticing especially when last week’s CSA box was still lingering in the crisper drawer until just a minute ago. Tomorrow is Thursday, my next CSA box arrives, and my students will be coming to meet me at the Open House. The juggling act begins. I still have five or six weeks of CSA boxes coming, so I’ll still be cooking. I’ll try to continue to post the recipes that work, but in warning, it could end up being a lot of soup. We shall see. This yellow curry uses Foxtail Farm yellow potatoes, carrots, yellow wax beans and delicious yellow onions. Not from the CSA were the garlic, spices and cilantro. Directions: Saute the onion rings on low heat until they begin to caramelize and then add the spices. Turn the heat up just a little and remember, you will hear the mustard seeds start to pop and turn a little gray. Move the spices around and add the garlic. Saute just until the garlic releases its’ fragrance. Next add the potatoes, beans and carrots and enough water just to be able to simmer the veggies, perhaps three or four cups. When the potatoes are tender, gently fold in the herbs. Serve immediately over jasmin rice.